One example is learning physical skills in sports. Players are willing to build their skills in practice for their own growth and that of the team. Some improve marginally, others improve immensely; some play just for the season, others for the rest of their lives. Regardless, over a specified period, all players commit to learning skills. In 2017, significant progress was made on the suite of applications: Skills Label, Skill Syllabi, Skills Based Approach and Skills Culture. Much of the development in 2017 was focused on Skills Label, which transformed from a display to a multi-faceted platform. It now has a dashboard (for administrators and users) and a landing page with a lot of functionality to do about anything with the labels. Another intriguing concept is the ability to create a series of labels based on students’ performance. Imagine starting a course with a single task. On the display itself, the technology can now accept published standards (like Common Core) and dynamic standards (devised by a group of professors). It is accessible as a SVG (native format), HTML, PDF, and PNG formats. A non-provisional patent was filed (after two provisional patents were expiring). Worked with a team of business and law students at Syracuse University to come up with an IP Landscape to move forward with the exciting technology. Over the year, I cannot think of a single discouraging remark about the learning labels. I hear over and over again: “having a single, standardized display to express learning expectations makes a lot of sense”. Skills Culture was launched and well received this year. Skills Culture is a growth mindset to be motivated and taking action to learn and apply skills. In a Skills Culture students and professionals: learn skills, prove competencies by demonstration and/or taking assessments, and practice skills on a daily basis (every experience). Consider abilities in education and career planning, but they are not the sole criteria. Thousands of viewers read at least one of the twenty-five blogs published this year. Practitioners are rallying behind the mindset as a way to motivate students and perhaps curtail the poor high school engagement numbers. In 2018, I am looking for guest bloggers to post insightful articles for the website. In 2017, I keep reading from practitioners (Tom Vander Ark) how we are in a transition from a traditional learning system to a competency based learning system. It is also evident by all the new entrants in competency based learning: like Southern New Hampshire, Governors, and Purdue in higher education and progressive schools and programs and states like Maine and New Hampshire in standard education. A solution, Skills Based Approach, was introduced in 2011 and has garnered an audience from around the world over the subsequent years. It is a methodology centered on the development of a skill set through a lifetime; users constantly cycle through four stages. In 2017, the focus has been to build awareness of how the methodology and application work through demonstration: a series of You Tube videos have been released to accomplish this goal. Skills Based Approach works in concert with other applications. 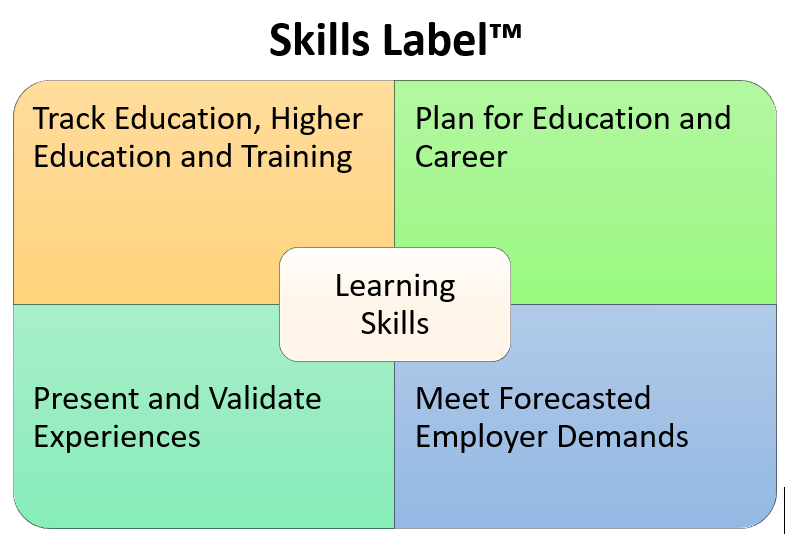 (Skills Label has features to address aspects of Skills Based Approach. Skill Culture provides a mindset to motivate students to apply the methodology.) And this was the intent behind the methodology: build or find new applications and simply plug them into the stages where they are relevant. Still, the overarching goal is to get Skills Based Approach as a mobile application in the hands of students. Let students manage their skills and competencies.